Tootin’ my own horn: I’m off to Australia! I’ve won a scholarship to participate in Australia’s Connecting Up conference this June. NTEN is pleased to announce the winners of our mutual scholarship program with Connecting Up to share nonprofit technology knowledge across the Pacific. 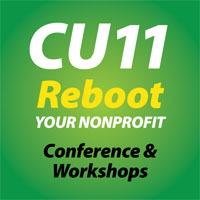 Through an application process, two NTEN Members were chosen to attend the Connecting Up Conference (CU11) in Melbourne, Australia, June 1-3, 2011 on a full scholarship! The lucky folks are Elijah van der Giessen of David Suzuki Foundation and Tatiana Marshall of Oceana. We look forward to hearing about their nonprofit technology adventures down under! The conference focuses on nonprofit marketing and technology, and my role in Vancouver’s Net Tuesday was key to my successful application, because one of the application questions was “How will you share what you learned when you get back home?” Yay NetSquared and Net Tuesday! This entry was posted in Net Tuesday and tagged Australia, Connecting Up, CU11, Melbourne, nonprofit technology, NTEN, Scholarship on January 15, 2011 by elijahv.